My favourite beverage is the source of my morning discomfort after a CBC article is blaming convenient packaging, including single use coffee pods, for the increase of curbside garbage in Canada. Canadians produced 9.6 million tonnes of garbage in 2012. That’s up seven per cent since 2004. That’s a lot of garbage, Canada! There’s a way to slow down this rapidly growing issue and it involves reverting to less lazy ways. There, I said it. We’re lazy and wasteful. And it has to stop. If we started doing things for ourselves again, we’d produce a lot less garbage and waste fewer resources. A French press is a brilliant little kitchen tool. It’s the size of your outstretched hand and costs around 10$. For that price, you can have one at home and one at work. Add two teaspoons of ground coffee and boiling water. Wait a few moments and push the grounds to the bottom of the glass carafe using the handle of the plunger and voila! A delightful cup of coffee totally adjustable to your coffee drinking preferences. Compost the grains and you’re hitting it out of the ballpark. I know the office world is mildly obsessed with k-cups. Sure they’re convenient but it’s time we redefine convenient. Saving a minute or two a day doesn’t quantify as a significant source of time savings. Do I really think a French press is our sole solution to excessive garbage production? No. I think replacing a package of convenience with a sustainable product is a great place to start the long road to shedding our serious dependency on throw away goods. Start with coffee and the next thing you know, you just might find yourself living a little more mindfully everyday. I think most of us are guilty of not giving a second thought to items we recycle, compost, sell or discard in the trash. I certainly don’t ponder the fate of cans or boxes after they’re picked up by the recycling truck. I trust that they go off to the recycling plant and are crushed, melted or broken down before being turned into something shiny and useful. I have a tendency to keep old ripped clothing that is unfit to be donated. I hope to do something magically crafty with it one day. I think it’s noble but apparently that makes me a bit of a hoarder. One reason I do this is because I don’t know what else to do with it. I won’t throw it out because it will sit in a landfill. I won’t donate it because it’s passing along broken junk that will probably get put in a landfill. So it sits in a box in my basement next to my sewing machine that has had too little use. I happily donate clothing that is in excellent condition. Those items will surely be sold or re-donated by the pre-loved clothing retailers or community services that receive them. But what of the donated items that aren’t deemed good enough for that? The old ripped shirts, sweaters with broken zippers, pants with worn pockets, socks that never found their mates and pajamas that have seen too many nights surely go somewhere. Check out Unravel for some answers. 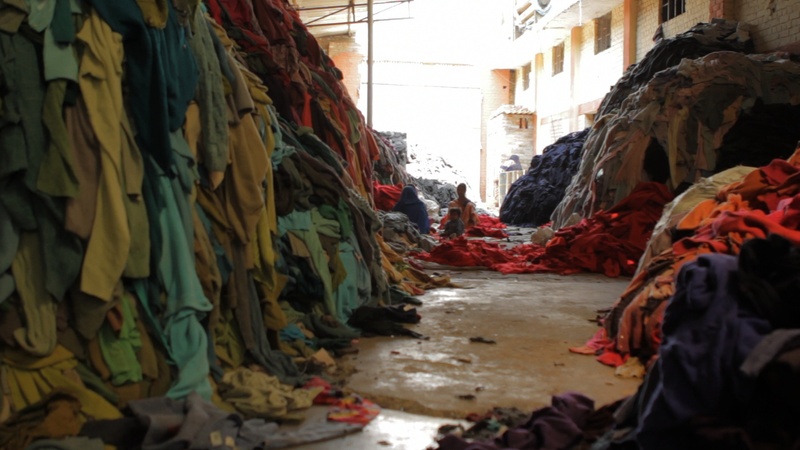 It’s an award-winning short film about garment recycling and the workers behind the massive industry so many of us know little about. It’s fascinating. Whether for good or bad, I’ll never think about donating clothing the same way again. I made it out to the Ottawa Farmer’s Market last Sunday for my annual spring pilgrimage. It’s a yearly event followed by weekly or bi-weekly Sunday visits to peruse stalls, lazily wander about, chat with vendors, have breakfast under a shade tree, buy food for the week and be in the company of like-minded folk. I wrote last week that I couldn’t wait to see how it evolved in it’s new location and I’m happy to say that it’s still the same lovely, abundant, cheerful and fresh market. I came home with bags full of wonderful products and a tired, happy toddler. But something happened on the way. I realized that our Sunday mornings would no longer be spent there. Now it’s not anyone’s fault. We, both myself and the farmer’s market, moved in the last few months and it’s affected our relationship. As I’ve moved more south, and further away from the city, it’s moved more north, and into the city’s heart. We’re breaking up because I can no longer justify driving 30 kilometres to buy fresh produce and local products. Our lack of proximity is turning us into different people. As I’m evolving into a “country” girl, it’s going trendy. As I’m pushing harder to stay local, it’s just gone too damn far. I will miss the region’s best honey, fantastic locally made cheeses and the best raspberry scone ever baked but my new home borders farms, food producers and more local-to-me farmer’s markets. Maybe one day this summer I’ll make the long trek downtown, struggle to find parking, sit in the shade under a concrete building and pick up that amazing honey, cheese and raspberry scone. But until then, I’m going to spend my weekends exploring smaller farmer’s markets and producers that operate near the village that I live in. I’m after community, outdoor space and local growers. It turns out that it’s all right in my new backyard! There are grains, cranberries, eggs, pork, lamb, vegetables, fruit, honey and many other wonderful things to discover…not to mention the Manotick, North Gower and Metcalfe Farmers Markets so close to home.